Kanbanize 5.9 introduces a Database Connector. It is in the form of a Java standalone application that runs locally in your network. With "Database Connector", Kanbanize allows you to periodically synchronize the result set of an SQL statement to Kanbanize cards. 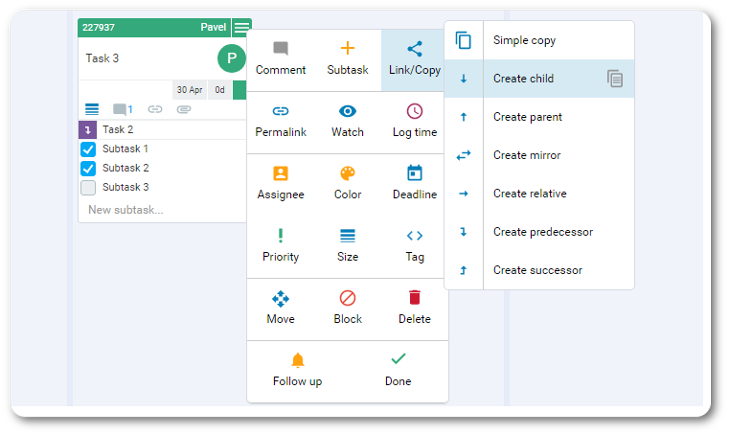 This makes it a suitable solution when your company is using a legacy system, but you want to track items in an agile workflow and make them more visible. For example, if a company has an internal ticketing system, the DB Connector will allow the extraction of the internal system information and will transfer it to a Kanban board as separate Kanban cards. The synchronizing between both systems will run at one-hour intervals. This means that once an hour, the SQL statement will be executed and all changes in the internal ticketing system will be applied to the Kanbanize cards. Find out how to configure the DB Connector in our dedicated article. In order to meet customer’s expectations, we improved the speed of our Kanban boards, drastically. 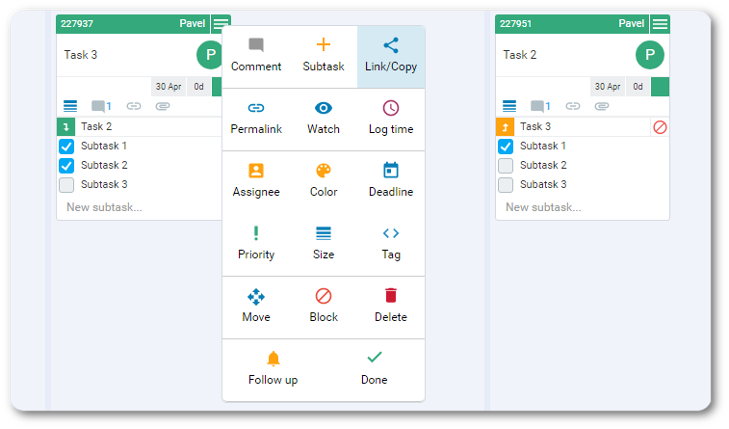 You will be now able to scroll through your Kanbanize boards and drag Kanban cards across columns and swimlanes much faster. 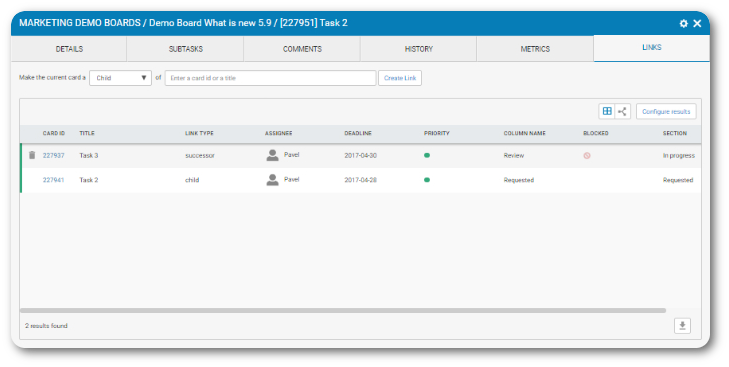 You can now drag and drop cards in the Backlog and Temp Archive without having to open the columns. The only thing you need to do is to drag the desired card, to the closed Backlog or Temp Archive until the column color turns to yellow. Then you just drop the card and it is already there. 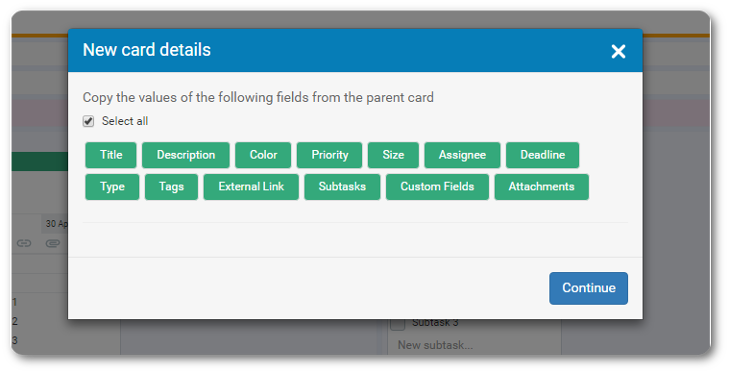 Kanbanize 5.9 introduces a new improved card design. Do not worry, the anatomy of the kanban card remains the same, but we bring it to another level in terms of clarity. At this stage, you will see that all parameters of the old card are automatically copied to the new one. However, in this case, you will have the opportunity of manually selecting (deselecting) all properties that you want to transfer to the new card. Afterwards, you’ll be able to manually fill in any specific information. *Note. This feature applies for all link types, excluding Mirror cards. For better visibility and accessibility, we moved the "Delete link" action just in front of the card ID. All you need to do is to hover over any of the existing links in your card and a small bin icon will appear just in front of the card’s ID. By clicking on it, you will have the opportunity to delete the link. Some of you have really big monitors, so we updated the search and public view to make use of the additional space. The columns are resized automatically, in order to avoid text cuts and make all information more visible. For information on how to share public boards check out our dedicated article. We hope all new improvements and additions will make your day better, while using Kanbanize.